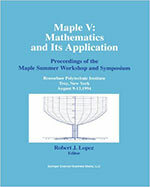 The Maple Summer Workshop and Symposium, MSWS '94, reflects the growing commu­nity of Maple users around the world. This volume contains the contributed papers. A careful inspection of author affiliations will reveal that they come from North America, Europe, and Australia. In fact, fifteen come from the United States, two from Canada, one from Australia, and nine come from Europe. Of European papers, two are from Ger­many, two are from the Netherlands, two are from Spain, and one each is from Switzerland, Denmark, and the United Kingdom. More important than the geographical diversity is the intellectual range of the contributions. We begin to see in this collection of works, papers in which Maple is used in an increasingly flexible way. For example, there is an application in computer science that uses Maple as a tool to create a new utility. There is an application in abstract algebra where Maple has been used to create new functionalities for computing in a rational function field. There are applications to geometrical optics, digital signal processing, and experimental design.